One of our blog contributors had been voicing his concern that BU was one of only two Hockey East teams with no recruits committed for 2010. That all changed this week with the Terriers’ first two verbals for the 2010 recruit class. And both have connections to the Bowling Green program. Defenseman Sean Escobedo, who completed his second season with Apple Core (EJHL), is a 6-0, 175, left-shot blueliner from Bayside, New York. He was named to the EJHL all-star game and finished last season tied for 8th in points (2-28-30 with 118 PIMs in 45 games) among league defensemen with incoming BU freshman Ryan Ruikka. Escobedo. whose brother, Brian, was a four-year starting defenseman at Bowling Green, will spend the next season or two with the Tri-City Storm, who made him their first pick—and third selection overall—in the 2008 USHL entry draft. U.S.Hockey Report suggests Escobedo’s stay in the USHL would be just one season, if BU loses a defenseman early. "Sean is a very mobile defenseman who can play offensively, like [Matt] Gilroy, or play the role of a defensive defenseman. Like Gilroy, Sean came up through the Apple Core system. It is great that Sean is signed and sealed [for BU] before going to the USHL. 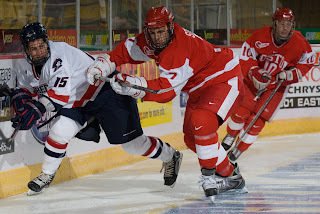 BU’s second 2010 recruit is 6-1, 170 winger Wade Megan, a senior to be at South Kent School. Playing in his first season at SKS, he put up a 24-29-53 line in 36 games as a linemate of Joe Pereira’s younger brother Mike (27-25-52), helping SKS reach the prep semi-finals. U.S. Hockey Report describes Megan as “a rugged winger, a power forward type who is difficult to knock off the puck and can finish, too.” Following his senior year at SKS, Megan will play a season of junior hockey before arriving on Commonwealth Ave.
Megan, whose father, Ron, played for Bowling Green in 1979-80 and 1980-81, hails from Canton, N.Y., and just may be BU’s first recruit from that St. Lawrence Seaway town since goalie Dan Brady, MVP of the 1971 NCAAs, All-American in 1972 and a BU Hall of Famer. 2009 recruit Ethan Werek reconfirmed his commitment to the Terriers last week, announcing he’ll spend next season with the Indiana Ice, the USHL team holding his rights, and then arrive at Commonwealth Avenue for BU’s 2009-10 season. 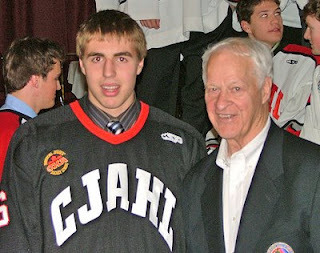 Werek (photo: at the Canadian Junior A Prospects game with legend Gordie Howe) had been a first round draft choice of Kingston in the 2007 OHL entry draft and the Frontenacs’ management had insisted that the 6-2 power forward would join the major junior club even after he declined last fall and skated with the junior A OPJHL Stouffville Spirit. The Out of Left Field blog chronicled Kingston’s pursuit of Werek. Despite missing a dozen games to injuries and playing in the World 17 challenge, Werek led the Spirit, a team co-owner by his father, Zeev, in scoring with a 29-41-70 line, edging teammate and incoming Terrier freshman Corey Trivino by a single point. He added another 19 points in 15 playoff games. 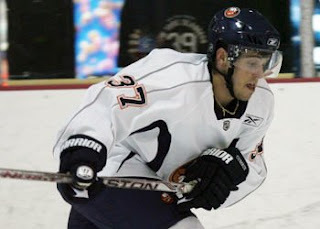 Werek earned OPJHL North Conference Rookie-of-the-Year honors, succeeding Trivino, the 2007-07 recipient. The previous year, Werek scored 59-69-128 in 55 games for the Toronto Marlies AAA. 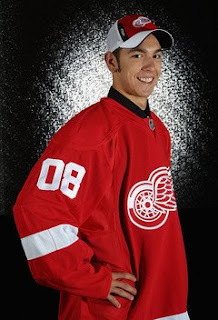 In an interview last season with McKeen’s Hockey Prospects, Werek discussed his game and the decisions that led him to commit to BU in May of 2007. In Indiana, Werek will be a teammate of former Terrier goalie, Brett Bennett. Meanwhile…. Trivino, a New York Islanders’ second round draft choice (#36 overall) who attended the Isles’ development camp earlier this month, is making one more stop prior to beginning his Terrier career. Over the weekend, he returned to Ottawa, where he had attended the 2008 draft, to participate in tryout camp for Canada’s World Junior Championships team. One of five Islander draft choices in camp, Trivino is the only invitee who was neither an NCAA or OHL player this past season. NHL.com offered a feature article on Terrier sophomore defensemen Kevin Shattenkirk and Colby Cohen, blue line partners last season and respectively the Avalanche’s first and second round draft choices in the 2007 entry draft. Both attended Avs’ development camp in Centennial, Colorado this month. Former Daily Free Press hockey writer Fluto Shinzawa reported, in yesterday’s Boston Globe Hockey Notes column, that Chris Drury is a likely successor to Jaromir Jagr as captain of the New York Rangers. Drury was a co-captain in Buffalo during his tenure with the Sabres. The column also noted that former Terrier captain and Bruins’ head coach Mike Sullivan is in the mix for the vacant top job behind the New York Islanders’ bench. Check out a good read from the Friartown Free Press blog, which has been added to the list of college hockey blog links in the sidebar. This past Saturday’s post examines the trend of surprisingly few prospects being drafted after beginning their college careers. Terrier center Colin Wilson was the only one selected in the first round this past June; only two were chosen in the first four rounds. The article also looks at college-bound draftees who become “one-and-done” or “two-and-through” collegians. ...the team supports Wilson’s choice to stay in school for at least one more year. Nashville will retain Wilson’s rights. “I think the most important thing is that he made the decision,’ Poile said. “He decided where he’d be most comfortable and we were totally on board for that. 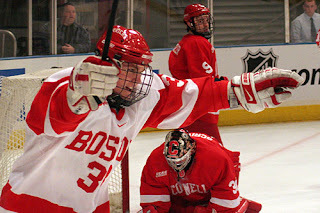 As the 2008-09 season approaches, The Terrier Hockey Fan Blog begins a series of Q&A interviews, one each with a member of all four classes. We begin with junior defenseman Brian Strait, whose solid sophomore season was capped by being voted, by league coaches, runner-up for the Hockey East’s defensive defenseman award and being named an alternate captain for next season. Strait recently answered our questions about his development as a defenseman and his team and personal goals for 2008-09. Q—You’ve now participated in three Penguins development camps. How has that heightened competition improved your game? A—It was actually only my second Penguins camp this past June. I feel that every time I go to it, I learn something knew. It is great to work with professional coaches and get their help in order to make the next step which is the National Hockey League. The things that I learn there have helped me become a better hockey player, which will give me the chance to help the Terriers win more hockey games. It is also great to meet the other prospects and make new relationships with guys you might be playing with some years down the road. Q—What are the Penguins’ coaches asking you to work on in your game? Is it consistent with the direction you’re receiving from Coaches Parker and Quinn? A—The parts of my game the Penguins want me to work on are the same things that my coaches at BU want me to work on. The Penguins coaches, BU coaches, my teammates, and I all know my strengths and my weaknesses. The only difference is how they approach ways to improve my game. Some of the drills I did at camp to work on something might be a little different than what we do at BU in practice. Q—Coach Parker touts the World Junior Championships experience for enhancing a player’s development? How did last year’s WJCs make you a better player and, as Team USA’s captain, a leader? A—Any time you get to wear your countries colors is an experience which stays in your memory bank forever. I have been fortunate enough to wear the USA jersey a number of times and it never gets old. I also have been fortunate enough to wear the "C" on that jersey a number of times which has been great. The level of competition at the WJC was the fastest hockey I have ever played in. The game was much different than college mainly because college hockey is North American hockey and, in the WJC, we played all European teams other than Canada. It is a great experience to take with you though when you get to play in an elite tournament like that to really test yourself against the best in the world. Being the captain of the team was another thing that did a lot for me. I had not been a team captain in about a year and a half before that, so it was good to stay sharp in that area by taking on the duties in that tournament especially because I am going to be in that type of role next year for BU. Q—What specific parts of your game are you focusing on developing going into your third season? And do you see yourself becoming what is called a “shutdown” defenseman? A—I have been happy with my personal progress over the past two years and hope to continue to build on that foundation this upcoming season. In order for me to be the best I can be, I will have to become a "shutdown" defensemen for our club this year. I will help out in the offensive end when I can, but most of the time I leave that to my partner Matt Gilroy. The coaches believe that I need to be that shutdown guy in order for me to have success and our team to have success. Every player has his role on the team; I really have to take that shutdown role and have pride in it so I can do my part for us to win hockey games. Q—How do you see your role as a team leader, now made official as an assistant captain, manifesting itself? A—I am very excited about being one of the captains on this team next year. Once in a while, when you don't have a letter on your jersey, you become more afraid to speak up or you might not hold yourself as accountable about things. I feel like every time I have been a captain I have done a pretty good job--other than at the end of the WJC when my team collapsed. I have been upset since the end of that tournament about the small things that I let slip, which ultimately cost us a medal. I now know what I have to work on to become a better leader and hopefully put that to use this year. Q—Coach Parker has acknowledged that, along with spotty goaltending, the unsuccessful switch to a layered defensive style led to BU’s slow start last season. With a largely veteran defense playing the man-style defense, what do you expect from the blueline group? Will this group be able to keep quality shots down, easing the adjustment for the rookie goalies? A—I was very proud of the way our defense grew up together last year. We had a slow start but once we went back to the man-to-man system, we became a rock back there. We were barely giving up any shots and the quality shots they were getting were not very good either. I think with basically all the guys coming back next year, we should have no problem continuing to defend the way we did last season. Q—What individual and team goals have you set for the coming season? A—I have one goal every year and that is to do whatever it takes to help my team win. There is no better feeling in the world than being on a winning team. When you’re on a winning team, that means everyone is doing the right thing and playing well, which in return fulfills your individual dreams. Q—What areas do you think the BU team must improve on in order to reach the Frozen Four? A—I am hoping that my teammates and I are not going into this season with our sights set on the Frozen Four. That mindset has killed BU teams in the past. A hockey season is like one big puzzle and the first piece of the puzzle is when we all get back to school and our conditioning starts. If we have guys looking past that, then we are going to have a slow start. Successful hockey teams live for the challenge, not the trophies, and that is what we will have to do this year if we want to be successful. Q—Do you think the team has the necessary talent and can develop the team chemistry and urgency needed to succeed in post-season play, something it hasn’t done the past two years? A—We have plenty of talent and chemistry can be made as long as everyone has the right mindset coming into the season. You don't get to the post-season without having a good regular season, so we have to concentrate on doing the right things in September in order to still be around in April. Q—Which of your teammates do you think is going to surprise BU fans with his play this season? Hockeysfuture.com posted a Q&A interview with Kevin Shattenkirk from Avs' development camp. HF ranks Shattenkirk as Colorado's #2 prospect and Colby Cohen as #7. There's a fourth Terrier at the Avs camp--Joe Sacco, now in his second season as head coach of Colorado's AHL team, the Lake Erie Monsters. NHL.com feature writer Mike Morreale caught up with the Saponari brothers at Thrashers camp with Victor explaining how he pushed his younger brother to compete with him. The Puckhead's Capital Thoughts blog, reporting from Caps' camp last week, offered kudos for Andrew Glass' strong play in an intra-squad scrimmage: "He plays hard and loves to get physical. Some of his hits led to chances down the ice." 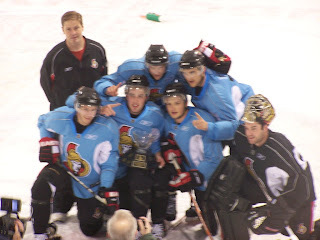 Former Terrier blueliner Joe DiPenta, one of six BU players to have won the Stanley Cup (2007-Anaheim) is taking his game to across the pond next year, signing with Frolunda of the Swedish Elite League. Last season’s two top Terrier scorers, co-captain Peter MacArthur and Bryan Ewing, will spend next week at Chicago Blackhawks development camp in Bensenville, Ill. MacArthur and Ewing had amateur tryouts last Spring with AHL teams Bridgeport and Springfield respectively. They’ll find familiar faces in Hawks camp: HE opponents Dan Bertram, Ben Smith, Joe Lavin and Simon Danis Pepin. We had omitted Brandon Yip from the list of Terriers who will attend Colorado Avs prospects camp next week in Centennial, Co., and have now learned that both Saponari brothers, Vinny and Victor, are on the roster for Atlanta Thrashers’ development camp, which begins next Tuesday in Duluth, Geo. Jay Pandolfo, as expected, signed a three-year, $7.5 million deal with the New Jersey Devils. The 33-year old former BU captain has spent his entire pro career with New Jersey. The Reading Royals (ECHL), an affiliate of the Los Angeles Kings and New Hampshire Monarchs, has made qualifying offers to eight players including former Terrier blueliner Kevin Schaeffer who split last season between Reading and Providence (AHL). Tom Ryan, former Terrier captain and defenseman and longtime analyst for BU hockey broadcasts—and sidekick to Bernie Corbett—has moved into the high school coaching ranks taking on the top post at his former alma mater, Newton North. Ryan has prior coaching experience at Babson College.